How to configure the DHP-W311AV? How to configure the DHP‑W311AV? The following steps will help you synchronize the DHP-W311AV. Step 1 – Connect both products to the same power socket/power strip. Step 2 – On the non-wireless device (the smaller device with the 3 lights) press the button (marked as 2 in the image below) for 10 seconds. The button is next to the network socket (marked as 1 in the image below). Step 3 – On the wireless device (the larger device with 4 lights) press the reset switch (marked as 1 in the image below) with a paperclip for 10 seconds. Step 4 – Check that the light with the icon like a house is lit in green on both devic-es. This indicates that both units are communicating. Step 5 – You can now scan for Wireless networks on your computer. 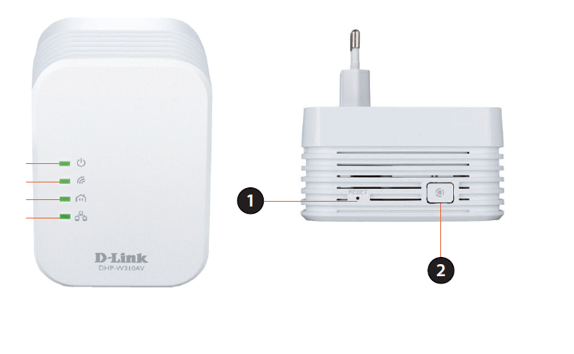 Step 6 – Locate the network name that starts with "dlink". 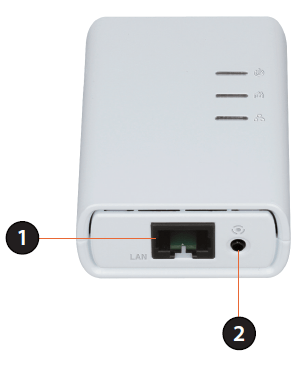 Step 7 – Connect to this network and enter the password as it appears on the card included with the device. Step 8 – Check that you are able to connect to the internet. Step 9 – You can now locate the wireless device wherever you want to use it. When the light turns green the device has finished booting up. Step 10 – Check that the light with the house icon is green. If not, then either try a different power outlet, or try moving the device closer to the router. 304 people found this useful.